Aha!!! I think I found the reason I chose to cast this particular author off of my reading list: Her sleuth willingly and deliberately kept a VERY important piece of evidence from the local police department! Her sole purpose for not handing over the crucial evidence was: she and her best friend wanted to solve the mystery! No, she didn’t attempt to give the police the evidence, only to be told to mind her own business, and that she didn’t know what she was talking about. She truly kept the evidence a secret which, had the police department known about, they would have been able to solve the mystery a whole lot faster. This brings me to these questions for you all! 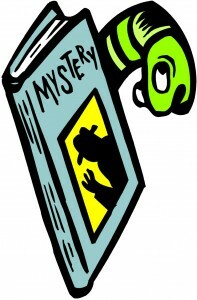 1) When you read a Cozy Mystery author, is her/his writing style more important than the actual mystery? Or are you able to overlook the mystery in favor of the author’s writing style? 2) When you meet a main sleuth who does something you find reprehensible (like impeding the solving of the case by withholding crucial evidence) can you dismiss it in favor of the author’s good writing and terrific character development? 3) Is it OK to have a flawed main character who does things you might not agree with? I am really struggling with whether or not to discontinue this mystery series. I had been enjoying the book so much, that I thought maybe I could overlook this sleuth’s actions. I’m still debating what to do… and wondered what you all thought about this. What do you think? 1) If I really love something about the writing style and/or the characters but the mystery was a little weak I will usually stick with the series until either the mystery component improves or the writing style degrades. Sometimes I get so involved in the characters antics I almost forget it’s a mystery and that’s ok if I like the characters. 2) If the writing and characters are good I can overlook “stupidity” from the main character but not if it becomes a main theme of the series. That was one of my problems with the above mentioned caterer. I simply could not take the fact that after 15 books she still freaked out over silly things and had not learned one dang thing from her previous investigations. No character development is the nail in many series coffins for me. Angela, I know exactly the type of sleuth you are talking about… I started a series a little while back that had two friends who did their sleuthing together. Unfortunately, at the end of the first four mysteries, either one or the other was in deadly peril. They both had a knack for making stupic choices to follow leads ON THEIR OWN when they thought they knew who the killer was. (Let’s face it, how realistic is it for someone to follow the person they believe to be a killer?) And, the other one would inevitably figure out where the culprit had her best friend (and fellow sleuth), and she would save her at just the last minute. That fourth book in the series was my final book with that author. Good grief! How formulaic can you get?!? As to your #1… Unfortunately, I am not totally involved with the characters. #2… This particular series has the potential of reversing the “stupidity” of the sleuths decision to lie to the police. #3… Both of the sleuths have many, many flaws, which I was able to overlook. Impeding an investigation, however, was one flaw too many for me. lol That sounds like one of the series I follow and that is one of the things that has driven me crazy too but I like the characters enough to overlook it (at least so far). And the mysteries are usually pretty good over all. Angela, I have found sleuths who I just cannot stand, either. A lot of them are in very popular mystery series, so I really try to like them. In these cases, I try reading the mystery books, but find myself stopping quite often to be critical of the sleuths who I don’t like. I start finding fault in everything they say, everything they do, in short, everything. That’s when I simply convince myself that these very popular mystery series are good for a lot of people, they’re just not so great for me. Writing style, plot, and character development is the most important thing to me when I read a mystery. Bad writing or “stupid” characters will be enough for me to toss a book for good. If I can’t get past the first couple of chapters I’m done. I can live with a flawed character or even one that goes against the grain as long as the overall integrity of the mystery remains strong. As long as I am enjoying the book that is all that matters. As the saying goes “too many books, so little time” to stick it out with a book you are not enjoying. Barbara, you and Angela have me thinking that maybe I’m being to hard on this particular mystery series. I mean, I was enjoying the book, I just got too involved when I saw the sleuths make that terrible choice just so that they could solve the mystery. But, maybe the fact that I was enjoying the book until then means that I really should continue with the series, since I seem to have been somewhat invested in the characters. Writing, character development and plot are all important but, of course, some books are lacking in one area or another. Stupidity only flies with me when there’s a reason for it. When the character develops and becomes, shall we say, less stupid-:). In the case of the book you reference, withholding the plot would only work for me if there was some unusual circumstance. Example: In Rhys Bowen’s, “Her Royal Spyness,” she withholds evidence at times because she is trying to clear her brother’s name. So that works for me. I like flawed characters but I think there has to be something about the character that makes me care for them. So if her flaw is something that strikes a bad note with me (we each have different ones! ), for instance, being incredibly selfish, then I have a hard time finishing the story. But as I mentioned previously, if she “learns” something or transforms into a better human by the time the book is over, I’m good with that. I totally agree with your example from Her Royal Spyness. That particular situation stands to reason… When a character does something like this to protect or clear a loved one. I wouldn’t question that at all. I know that I tend to be very opinionated. I find that many of those around me see me as someone who never finds the gray… it’s either black or white, right or wrong, good or bad. Hmmm… You’ve got me wondering if I should just overlook this, and try to give the sleuths a break! I think the best advice would be to ask yourself a few simple questions related to the book. 1) Do you care what happens to the sleuths? 2) Are you even a little bit curious to see what happens next? 3) You enjoyed the book but did you enjoy it enough to overcome the problems? I’d say if 1 or 2 is a yes then maybe give it one more shot . If those answers are no then it’s probably not worth the time. Regarding your first question: I did care about what happened to the sleuths UNTIL they decided to withhold that very crucial piece of evidence. As for your second question: I skipped ahead in the book when I saw this “stupidity plot” and found that the police detective pretty much forgives the sleuths for withholding the evidence, although he does say the police could have solved the case a lot sooner had they had it. Your third question was a doozy! I was REALLY enjoying the book until this happened. I have a lot to think about… Those were some doggone good questions, Angela! Oh, no, I cannot abide by “too stupid to live!” I blogged about this the other day–the “Meet me at the boathouse at midnight and I’ll give you a clue/tell you whodunnit. Don’t bring anyone or tell anyone…” And the heroine GOES THERE! Yes, it’s enough for me to stop a series unless I’ve already read several books by that author and then find it in just one book. As for the “withhold from police” yes, I stopped reading a series because of it. It was the third book in a WONDERFUL series and within the first few chapters, the heroine withheld information. I thought perhaps she sensed something good in the character she was trying to protect. But no. Turns out the guy was guilty, she had NO earthly reason to withhold the information—and at the end of the book? She went hog wild following the “culprit” without telling anyone. She put herself in a lot of danger for no logical reason. I haven’t picked up another book in the series since. I still don’t understand why the author didn’t have the heroine try to tell the police what she saw. The police could have ignored her or…did she have to see it? I don’t know. It made no sense. PLOT HOLE. It’s really hard with character flaws. People aren’t perfect, but there are some flaws that just make me stop reading! It’s too bad because sometimes the author is quite talented in other areas of writing. Maria, I love your example about the boathouse at midnight meeting… with a person the sleuth believes might be the murderer. Been there, done that! But, haven’t we all?!? Duh! would you even meet an acquaintance at that time and place?!? Alone, no less! I also read cozy mysteries primarily because I like the characters – and I have stopped reading series because the main character has annoyed me in some way and I just don’t want to spend time with. While I generally don’t like characters that are too stupid to live – I have to admit I have been following a series (not a cozy mystery) where the heroine does some incredibly stupid things – such that I would frequently ask myself why I was reading these books as she was so stupid (particularly early in the series). The saving grace was that this was not a case of an author not realizing she had created a stupid character and in later books, the character has shown signs of growing up and occasionally shows glimmers of sense. In that case, I kept reading because the character had other redeeming qualities that I still enjoyed spending time with her and her friends and I have been glad I stuck to it and hope to see her grow some more in future books. Judith, your example of that character reminds me of a very dear friend whose children were the same ages as mine. She absolutely hated the Amelia Bedelia books. Amelia’s inability to not take things so literally just made my friend cringe – Expressions like hit the road, ringing in your ears, bulbs in the garden, ETC. made my friend think that Amelia was just too stupid for words. You are much kinder than I am… regarding giving a favorite author time to let the character grow up and come to her senses. I have put this particular author on my reading back-burner, and will continue contemplating whether or not I would be willing to overlook withholding evidence. I know that I have read other Cozy Mystery series where the author got around this problem by just making the police department incredibly idiotic… making them disregard crucial pieces of evidence just because the person finding the important clues was a non-official crime solver. I just finished reading one of the “catering” books and I must say, I was not pleased. The main character gets worse with every book. She not only does dumb things but, she withholds facts from the police (she is married to a policeman), her dumb actions put her and her family in danger and she is just too clumsy for words. This is the last of this series that I will read. I look for a good plot and then sensible characters. Oh Mae…the clumsiness, I forgot the clumsiness..UGH that drove me crazy! No human being can possibly fall more times in a day than that woman! And I always marveled at how she was able to stay in business, no caterer can be that scatter brained and be successful, lol. Motivation is an important factor for me, as some of the other people here have mentioned, and so is writing style. If I just don’t like the author’s ‘voice’, I won’t bother keeping on. I guess we all have our sticking point, and I’d rather go look for something better, than continue reading things that offend / don’t appeal to me. Susan, sounds like the publisher wanted more pizazz in that crime series! It seems to me that more and more publishers think we all want sizzling dialog and situtations. Perhaps the majority of their readers do, but it is a sure way to lose some of their other fans who want characters and writing styles, without the almost-perfunctory snap, popple, and crack! I think realistic characters include flaws. When those flaws run counter to our own moral compass, then it’s hard to like them or the book. If their motivation to do something reprehensible or even just misguided makes sense within their character (and the readers) then you have really good characters. Sometimes you don’t particularly like a character but you understand them and they interest you. Lately, I’ve found many of the cozies with a gimmick (cozies built around a hobby, special interest etc) to be really problematic. It seems the mystery plot is sacrificed for the sake of the hobby. So everything stops while we have a little lesson on quilting, or coffee making or something. The gimmick needs to move the plot along or enhance our understanding of the characters. The movement of the plot shouldn’t stop for a lecture. Not what you asked but it’s annoying me lately! And that’s my new YUCK category. I totally agree with you both, Gail and Maria. What a great topic for an entry! 1) An extremely good writing style will more than make up for a slow/flawed character development, and hold me to the end of the book. Poor writing won’t get me past the first few chapters regardless how good the story may be. 2) Yes, I can forgive a sleuth for withholding evidence because that is usually written in as part of their personal “character flaw” and I just accept it as such. It is just a book – not real life and I am reading it for fun. I wouldn’t recommend withholding evidence in real life. 3) I don’t mind reading about people who do things that I don’t agree with. Otherwise I would not read the Bible – it is full of good and bad examples of how to live one’s life. If it is something that you feel strongly you disagree with – then put the book down and go on to something else. There are plenty of other books out there to be read, no sense wasting your time on something that you don’t feel comfortable with. I read these cozy mysteries for fun and enjoyment – I don’t take them too seriously. But I don’t waste my time on poor writing either. I have run across a few authors that I was amazed they even got published. They get tossed right away – back to the library or in the trash – whichever. Judy, I’m with you on the poor writing. When I read something by a PUBLISHED author that is, simply put: poorly written, I wonder not only about the author… but also about his/her editor and the publishing house. You’re also right about these books being there for our fun and enjoyment… When my husband and I watch television together, he often has to state that the shows aren’t “real life” situations. I ALWAYS have comments about how unrealistic situtations are, or ask why all of the actors/actresses are absolutely stunningly gorgeous, ETC. I need to loosen up! I, too, have found a lot of authors who I absolutely cannot believe have been published! This is a fascinating discussion, Danna! I’m thoroughly enjoying all the insights and comments. Yes, the stupidity issue will make me lose interest immediately. That’s probably my biggest pet peeve, in books and also in movies when the character in danger runs up the stairs, knowing this means she is now cut off from escape and that the bad guy is right behind her, instead of running out the front door and yelling for help! Withholding evidence is another pet peeve. In my opinion, a good writer is able to build suspense and keep things moving along nicely without resorting to tricks of the trade such as stupidity and withholding evidence. In fact, the use of such things indicates a lack of skill, and this will cause me to avoid that writer’s books in future. Donna, it sounds like you have seen some ot the same shows/movies that I have! Gee…. Should I run out the door, or run upstairs and hide in the closet? Imagine how short some of those shows/movies would be if the characters took your advice and hit the door screaming for help! Uh, no … because to me, each character should be wholly authentic; i.e., a sleuth should wish, above all, for the mystery to be solved, the criminal to be caught. Withholding evidence is in direct conflict with this goal. The only stipulation I would make is cited above: as in the Rhys Bowen mystery: when someone dear to the sleuth is in danger of being put into the criminal justice system. The police are looking no further because they have evidence to make a good case against the dear one, and the sleuth knows [or better yet, must prove, in spite of personal doubts about the dear one] that the loved one is not guilty. I think the device I can live with is when the sleuth tries to tell the police but is either brushed off by a stupid person in the department, or by a hostile or long-suffering detective. On the other hand, we all know people who are on diets but overeat, who have a few too many cats, and the house doesn’t smell its freshest, but the person is full of love … this is the kind of character flaw I can live with in a mystery, and one that makes characters more authentic and endearing to me. Marja, I guessed that the reason they were withholding crucial evidence from the police was because they thought it would be fun to try to solve the case. Like it would be sort of a lark to find out who the killer was. I have certainly read Cozy Mysteries where the sleuths tell the police department and then get a tepid response from them. (There certainly are a lot of idiotic police in our Cozy Mysteries!) But, in this case, it seemed like the author wanted to make the police a competent group, so the sleuths simply couldn’t tell them about the evidence. PS>>> I know all to well about “people who are on diets but overeat”… More on that another time! I just found your lists and blog today. Thanks for putting out this valuable info!!! My view of the above “situation” is this…I would continue with the second book. Maybe the author will address this character flaw and make adjustments or incorporate the flaw into the plot such as getting in trouble for withholding info. So, I suggest reading the next one and continue or drop based on how the author continues. Welcome to the site, Nancy! I still have the rest of this particular mystery series in my TBR (To Be Read) bookshelf. But, I must say I found this particular situation very problematic. Either make the police department incompetent and dismissive, or tell them everything you know when they ask. Yeah, I recently got annoyed at a scrapbooking mystery heroine who withheld a piece of evidence in, I think, the second book, because she figured the police would ridicule her if she showed it to them. Um, you won’t know if you don’t try, and who just picks up things from crime scenes and keeps them without calling the police? I guess if you’ve got the chutzpah to pick something up from the crime scene and hold onto it you’re not inclined to call the cops anyway . . . but it broke my suspension of disbelief you have to have when watching movies or reading books, it was too much. Also, recently, a chocolate mystery series I read 2/3 of them from the library, and 1/3 or more of them I figured out who dunnit within the first 35 pages. Not why, or any accomplices, but I was right on the main suspect. I finished the few I had left to read, but I’m not sure I’ll pick this one up again. And the relationship between her and her boyfriend then husband, their HUGE communication issues . . . . oh and all the problems with cell phone usage and lack of reception, yes it happens especially in areas around a big lake like that, but early in the series before cell phones were as commonly used, it felt like the lack of a cell phone played a major part in say the bad situations she’d get into later in the book. In later books her husband is so often, almost always, away from his phone, or it’s out of battery power, etc. that it just seems too often used to maneuver things the way the author wants them. After reading these books you’d think cell phones were the stupidest things on the planet. I think we each have different things that we are willing to overlook. One thing that drives me crazy is constantly changing point of view without any indication of who is “speaking”. There is one very well known author who does this constantly and although the stories are good, I have crossed her off my list. I have one series I stopped after book one because the sleuth was just a mean person. I guess that means likability of the characters is an important factor for me. I have another series that the first book moved slowly, but I just loved the titles of the first and second books so much, I really wanted to like the books. After 30 pages of book 2, I couldn’t focus on the story so I let it go. So pace is another factor for me. I usually have no problem with mysteries I solve early on, so long as the character isn’t missing extremely obvious clues or developing strange and unexplained memory gaps to keep the story going. Jo, one of the mystery series that I really, really enjoyed was M. C. Beaton’s Agatha Raising Mystery Series. I have to admit that Agatha was not a very likable person, but I did find her antics quite funny. I certainly can identify with an author who you feel you really want to like. I have tried many, many authors I really, really wanted to enjoy, but for some reason wasn’t able to do so. I am not as kind as you are >>> If I can’t focus on a story line within the first fifty pages of the first book, I’m out of there. To get away from this topic, has anybody heard anything about the new Chief Inspector Barnaby? I thought they already produced the new episodes of the Midsomer Murders, but so far there’s no news as to when they will air it in the US. I read a mystery series based upon how well the characters are developed and how I like them. I really enjoy following the story lines of the characters from book to book. Like many others have stated, I can’t stand stupidity. It illustrates the lack of imagination of the author. I stopped reading one series when the author killed off a main character (the love of main character’s life) after about ten books. If the beloved character was killed off in the first or second book, it would have been fine. BUT to do it 10 books in was cruel to the reader. My daughter was reading the series and also stopped. So it wasn’t only me – the disappointment went across generational lines. This particular series has continued, so obviously other readers didn’t feel the same way I did. I also won’t read any series that involve the death or murder of a child(ren). MJ, I stopped reading a series when the author made the husband of one of the main secondary characters the culprit of one of the books… I can’t remember whether he died, or he was going to prison for the rest of his life, but in the very next book of the series, there was absolutely NO mention of him! Good grief! That was enough to do it for me! As for your example… clearly the author wanted to get your main character into the dating pool again… Cheap shot for the loyal readers. When I see such obvious plot developments, I usually envision an editor telling the author that readers’ polls indicate something or other sells more books. I don’t mind flawed characters – I kind of relate to them! Another series – I almost quit, but I discussed my predicament with my book club and they convinced me to keep at it. I’ll admit I skimmed (ouch) books three thru six (?) but eventually I liked the story as much as I liked the main character and I’m glad I stayed with it. I try to read a new – to me – series from start to the latest entry, then read a stand alone novel, then start a new series. I usually give a new series three books. If the main character doesn’t keep my interest at that point, its not going to happen. This is a good subject to bring up! I too have noticed this, but have been so busy getting seriously irritated with the character for being so Darn Dense! that I can’t think of anything else. I just get so Mad that a perfectly good character is having such brain lapses as these. Your comment/question also made me realize that the rational the character uses is Worse than doing the actual deed! Seriously, did they just not say, If something doesn’t turn up their friend’s in trouble. Author, please!, these may be “cozy” but that doesn’t mean readers are stupid! Why thank all those who’s brains were picked for true/factual information then write this!? Cindy, it’s funny how this very same thing has bothered so many of us. I have left more authors because of this problem. If the sleuth is an absolute idiot, I’m really not interested in keeping her around! There’s something about an amateur sleuth ALWAYS being smarter than the police department in her/his town. If that’s the case, I’d move quickly!